I love Arnold Friberg. Up until I actually read it for myself, his paintings were my favorite part of the Book of Mormon. His art has captured my imagination like no other Church art. Not only are his paintings awesome, but they're also fun. 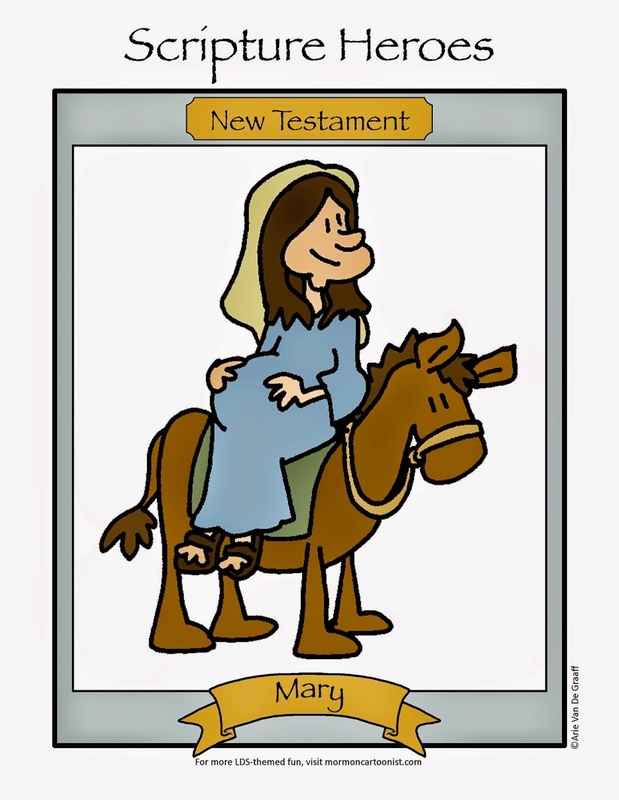 The fact that he drew his scripture heroes eight feet tall and muscular enough to put the governor of California to shame, simply endears him more to me. It's that reason, that every ancient prophet, apostle, or scriptural footnote; should be chomping at the bit to have Brother Friberg portray him now. I love Arnold Friberg's paintings. We have 2 large paintings of his in our family room one of which is the very famous one of George Washington praying in front of his horse. Is that Peter standing at the gates of heaven? Really? I think you need to add the label of "false doctrine" to this one. I like your drawing of Bro. Friberg! And thanks for the mention and the link. I've added a link back to yours, too. Now we can trap our readers into an eternal loop -- just like on Star Trek! Arnold Friberg's art is amazing. I love your idea. 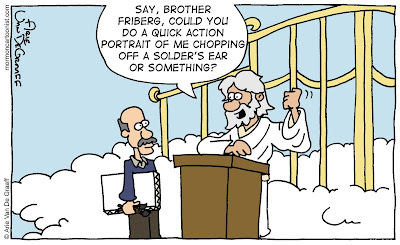 Along with Brother Friberg, I can't help but think that there will be Book of Mormon characters waiting for you to sketch a cartoon version of them when you arrive. About King Noah... when Gideon is chasing him around the palace and it is recorded that "he fled" and "he ran" I can't help but picture a big fat man from Friberg's art. It does reduce the action and adventure. I mean how fast could that guy really run? Jena, you also own some prints of his college football paintings, which are equally awesome. Kevin, you're referring to that episode of Star Trek: TNG where Kelsey Grammer guest starred and...wait, if our goal is to increase readership, shouldn't we stop highlighting our geekiness? Mindy, I would totally get into family history work if all it required me to do was draw caricatures of my ancestors. Lindsay, I'm sure Noah's later suggestion to leave the women and children behind to fend for themselves against the Lamanites was because he was worried they'd pass him in their race to the wilderness. I had no idea those prints in Gabe's room were his. I really do become smarter and smarter every time I read this blog. And geekier, with all the Star Trek and other science fiction comments. Thanks for the Friberg dedication. The moment I saw his obit in the local paper I thought you might be paying tribute to a fellow Mormon artist. Large forearms everywhere will mourne his loss. Arie, this one is hilarious. A good send-off for Bro. Friberg. Thanks, Cartoonista. 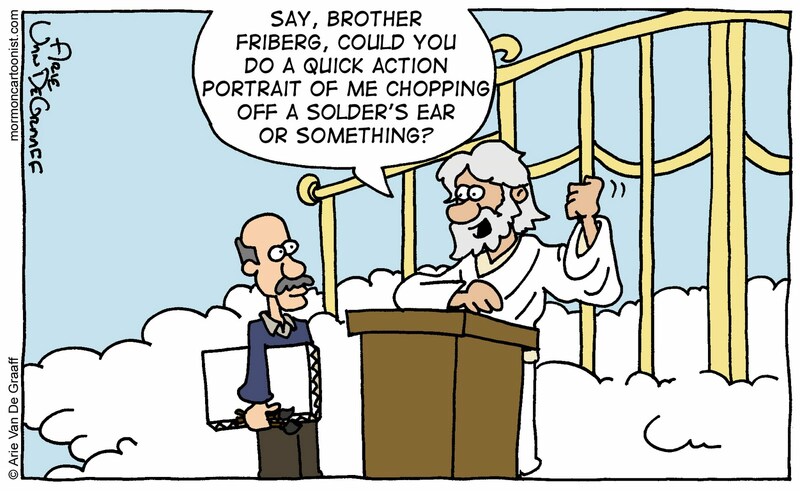 It's great to meet another Mormon cartoonist. Everyone, be sure to check out Cartoonista's stuff. It's quite good.